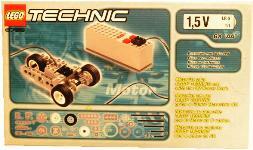 Contains strong 9V motor with speed reduction, long electric wire, large batterybox, different gears (with the very useful gear with clutch) and a lot of other Technic parts. In the manual there are some clear examples on how to use these parts, for instance to make a small electric car with a clutch. Wheel and tires for this car are also included.